According to Colorado police, Lance Armstrong literally hit two parked cars with his car in Aspen, and figuratively threw his girlfriend under the bus. Hansen initially told police she had been driving home from an Aspen Art Museum party when she lost control of Armstrong's GMC Yukon on the icy roads, hitting the cars. She said she drove because "Lance had a little bit to drink," according to the reports. "She said, 'I'm Anna, we're the Armstrongs, my husband's Lance, he was just driving maybe too fast around the corner or something,'" the man told police, according to the reports. He called 911 to report a hit-and-run. Hansen and Armstrong left the scene before police arrived. 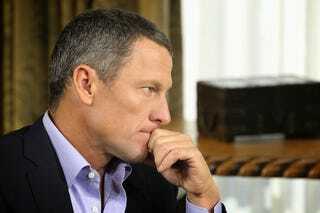 Police cited Armstrong with failing to report an accident and speeding on Jan. 12.